The Sustainable Foods Summit will focus on health impacts, sustainable ingredients and green marketing. For the tenth consecutive year, the European edition of this executive summit will be hosted in Amsterdam, on 7-8th June. The Sustainable Ingredients session will feature raw materials with ecological/societal credentials. The growing use of food ingredients from side streams will be discussed, whilst other speakers will give an update on sustainable palm oil and natural flavourings. Norbert Schmitz from Global Risk Assessment Services will explain how food companies can develop sustainable and deforestation-free supply chains for their ingredients. Piet Haasen from the Sustainable Juice Covenant will show how the juice industry is mitigating supply chain risks and encouraging sustainable juice production. 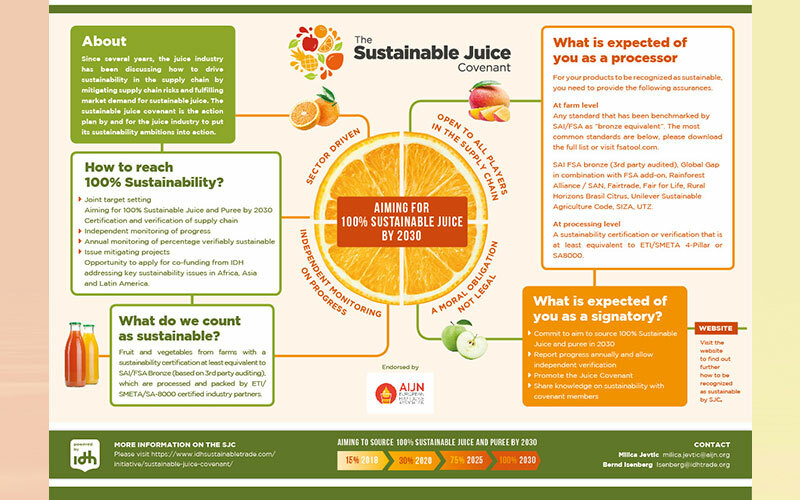 The Sustainable Juice Covenant (SJC) is a global initiative to make the sourcing, production and trade of fruit- and vegetable-derived juices, purees and their concentrates 100 % sustainable by 2030. With the support of AIJN, the European Fruit Juice Association, the companies work together to increase social and environmental sustainability at farm and processing level by rolling out sustainability certifications throughout the supply chain. Globally, fruit juice and nectar consumption is at 38,5 billion liters – and 9,6 billion liters in the EU, the biggest consumption region. As the market grows, they recognize that sustainability is the way forward for the juice industry.